Hypoxia, which reduces oxygen tension, is important for maintaining homeostasis in the human body. While cellular responses to hypoxia are important for maintaining normal homeostasis, it has also been shown to promote tumor growth, as a stress factor and signal, and can lead to resistance of the tumor to therapies. 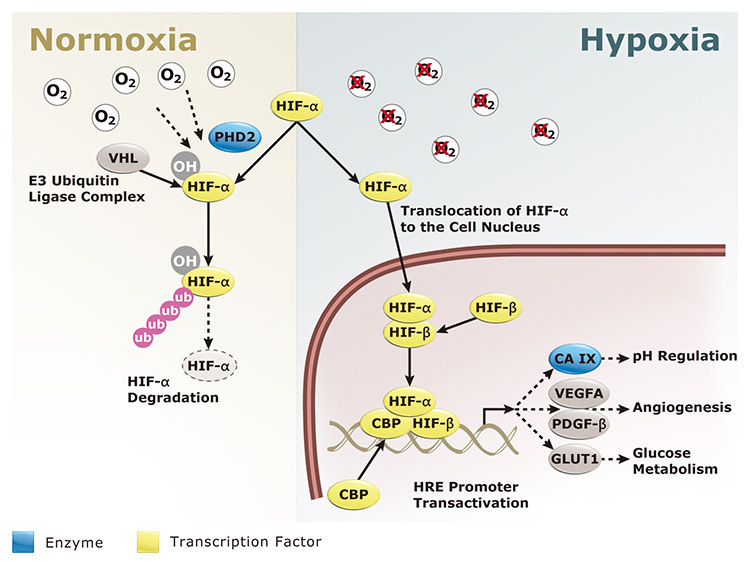 Hypoxia-induced transcription factor (HIF) is the mechanism of response to low oxygen content in cells. HIF consists of α and β subunits, but the hydroxylation of HIFα subunits is what mainly controls the regulation of HIF, which thereby affects transcriptional activity and stability of proteins. There are two isoforms of HIFα, HIF-1α and HIF-2α. HIF is required for glycolysis activation in tumor cells and some research studies have shown that HIF promotes growth in tumors. Based on experimental data, scientists believe that hypoxia causes dedifferentiation of tumor cells that can lead to increased cell invasion and tumor growth. This dedifferentiation can also lead to the epithelial to mesechymal cell transition (EMT), which is a complex dedifferentiation program. The down regulation of E-cadherin expression is a hallmark feature of EMT and invasive and metastatic cell phenotypes. Researchers have indicated that HIF may be capable of regulating E-cadherin, and as an indirect result, affecting EMT. Additionally, the HIF target gene, lysl oxidase (LOX), has shown to be involved in the regulation of E-cadherin. HIF-1, which is required for hypoxia induced tumor growth, directly targets LOX. The lysl oxidase family is a collection of amine oxidases that catalyze crosslinking of collagen and elastin side chains. This crosslinking stabilizes proteins in the extracellular matrix. LOX and the LOX-like protein, LOXL2, are highly expressed in numerous types of human cancer. Researchers at the University of Erlangen-Nuremberg and the University of Oxford have demonstrated that lysl oxidase activation is required for the repression of E-cadherin by hypoxia. The experiments also proved that hypoxia and HIF regulate both LOX and LOXL2. This was the first research study to show that HIF-1 directly targets LOXL2 and that LOXL2 can directly repress E-cadherin on its own. The lysl oxidases utilize both inhibition and overexpression mechanisms in order to repress E-cadherin. However, the detailed molecular mechanisms of E-cadherin repression are still unknown. The scientists also found that LOX activated Src kinases and the focal adhesion kinases, which are two proteins that enable cell migration. 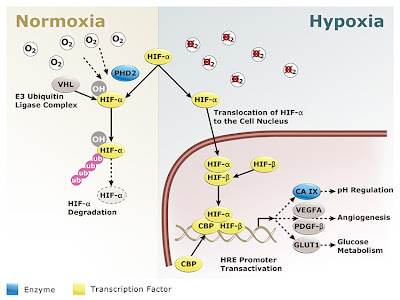 A previous research study has shown that hypoxia activates LOX gene expression, but maintaining enzymatic activity requires continuing reoxygenation. This reoxygenation causes activation of both the Src kinase and the focal adhesion kinase. Other research groups have also found that LOX was overexpressed in a variety of cancerous tumors and LOXL2 promotes breast cancer cell migration. All of this research demonstrates the importance of hypoxia in cancerous tumor growth, and lysl oxidases are at least one signaling pathway that influences hypoxia. While both LOX and LOXL2 have been found to have similar functions, their gene regulation may differ. However, both lysl oxidase proteins exhibit a significant impact on tumorigenesis and the progression of cancer. LOX and LOXL2 have the potential to be therapeutic research targets. Researchers could design an anti-tumor therapy that inhibits the lysl oxidases, which would also result in a reduction of hypoxia, a lack of E-cadherin repression, and possibly a reduction of tumor cell growth.